heartburn or a burning heart? aka begging for mercy. We rarely get up early on Saturday mornings. I do. Z does not. We kind of have opposite schedules. I like the relative peace of the morning, a lingering coffee wake up on Saturdays with catch up reading on blogs, pinning and watching the odd history show on the dvr. Lately though, that’s been changed by some stress induced, I suppose, heartburn. I am the lucky recipient of a new morning routine that includes a half hour wait for Nexium to kick in. But this weekend, we got up early together and headed out to The Coop to try their breakfast menu. The Coop is lovely at 8:30 or so on a sunny Saturday morning. All warm worn wood and southern specialties. Biscuits, pecan smoked bacon, gravy and such. I tried the poutine. For the uninitiated poutine is fries with cheese curds and brown gravy. 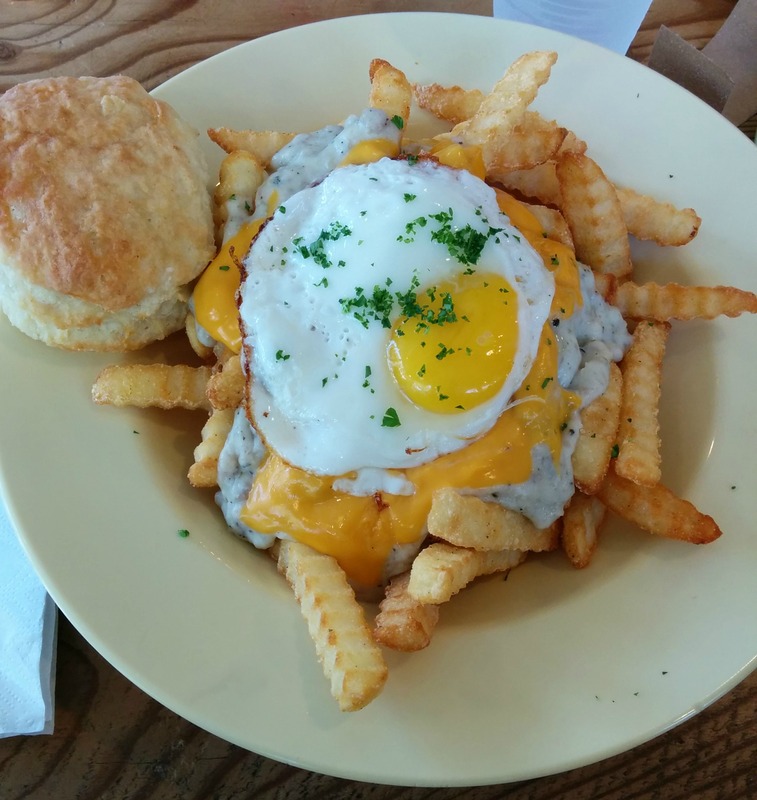 For the Southern soul it included sausage gravy, cheese sauce and a fried egg. Actually, all in all, more than I wanted. More than I could (or indeed did) eat. I would have like it in a smaller portion perhaps, with a lighter (is that laughable?) touch? Skinny fries with some shreds of cheese over plastic cheese sauce? Really, I’m probably over the poutine fad now, this probably clinched that for me. It isn’t that it wasn’t tasty, just a little too heavy handed for me. Have I changed? I’ve been doing quite a lot to eat lighter-fruits, salads, veggies and fish, that kind of thing. Walking it off. This reinforces my resolve.